NBC and the Hollywood Foreign Press Association have reached a deal that will allow the network to stream Golden Globes online for the very first time. The decision to live-stream for the first time shows a changing of the tides when it comes to viewing television and media in 2018 and it's expected to start a new trend allowing higher profile awards shows and events to be streamed online as well. Each year the Hollywood Foreign Press Association gives out the Golden Globes in recognition of achievement in film and television. Former Saturday Night Live head writer and current Late Night host Seth Meyers is set to host the show, which airs on Sunday evening. 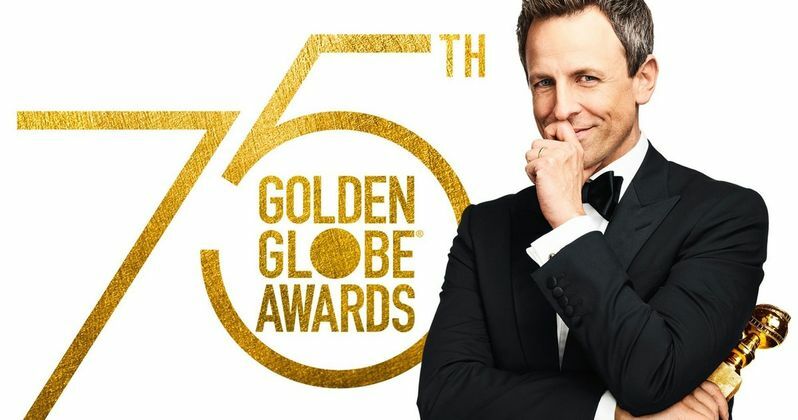 Deadline reports that the 2018 Golden Globes will be live-streamed for the first time via NBC's website as well as through mobile apps and on various services including DirecTV Now, Fubo TV, Hulu Live TV, Sling TV, Sony PlayStation Vue, and YouTube TV. Additionally, Facebook will stream this year's pre-show red carpet festivities. The move to stream the awards show online is partly due to the backlash on social media over the lack of ways to access last year's show and now viewers will have more options than ever to tune in to the live broadcast. The Golden Globes are the precursor and the sometimes predictor for the more prestigious Academy Awards. The awards ceremony was first televised in Los Angeles by NBC in 1958, and later went national in 1964, broadcasting all over the United States. The Golden Globes is unofficially the less uptight version of the Academy Awards. Booze often flows freely and actors generally end up speaking their minds more while on stage and this year is ramping up to be an interesting event due to the political climate and the current state of the entertainment industry. Related: Oprah Running for President in 2020? Seth Meyers is vocal opponent to President Donald Trump and there are more than a few interesting stories floating around in the world of politics. Myers is expected, as are many of the Hollywood elite, to take some time to speak directly to Trump while on stage. More importantly, the Golden Globes will have to acknowledge the current state of the entertainment industry in the wake of the multitude of sexual assault and harassment allegations that blew up at the end of last year. Outside of the movies that are nominated and the actors and actresses that are supposed to attend, many will be tuning in to see how the Golden Globes and attendees address the controversy. Though Seth Meyers has written for Tina Fey and Amy Poehler while they hosted the Golden Globes, this will be his first time taking the stage to host. Myers has hosted the Emmys and the ESPYS in the past to praise and his turn on the Golden Globes is expected to be a next level for the writer and Late Night host. The Golden Globes airs in Sunday, January 7th on NBC at 5:00 p.m. PT/8:00 p.m. ET with the red carpet show on YouTube about an hour beforehand. You can read more about the Golden Globes streaming online for the first time ever via Deadline. Oprah Running for President in 2020?